Many of us will know that having a sick child is never fun, but having a child sick with something undiagnosed where the symptoms keep changing is a rather frightening experience. Last week I went back to work and our little man spent a couple of days at a local holiday programme. On Friday evening we met up with friends at one of the local beaches for a BBQ picnic and a game of cricket, but he wasn’t very happy at all, was tearful, cold, argumentative and wanted to go home and generally just not like himself at all. Once home we noticed his shoulders and back were sunburned from his time at the holiday programme and put his unusual behaviour down to too much sun. The next day he was sleepy, very odd for the middle of a Summer’s day and after a nap of a few hours, he woke with a temperature of 40.5°. Sunday passed by in a blur of cold flannels, medicine and a cold bath to try to bring it under control, but by Monday morning it was off to our family doctor. He diagnosed a form of heat exhaustion as couldn’t find any other symptoms to tell him differently. The temperatures continued, medicine continued, another wakeful, shivery, overheated night later and we noticed he woke with very red eyes. By mid afternoon a rash appeared all over his face, neck and upper abdomen and as we still hadn’t been able to get the temperature under control without medicine, we went back to the doctor – we’d have to get blood tests to check all sorts of things so he could make an accurate diagnosis, but possible illnesses could include the likes of German Measles, Glandular Fever and Measles, but given he’s had his shots, measles was unlikely. Or it could just be a nasty viral bug and the rash a sign that his body was dealing with it and would soon send it on it’s way. Oh, and now we needed antibiotics…just in case. We managed to get through until 4.45 am on Wednesday before the temperature struck again, but after more medicine and sleep, he woke with slightly whiter eyes and the rash, although still evident, seemed to have faded – Welcome Day 5! Thankfully the test results all came back clear so 6 days of thinking the worst but hoping for the best came to an abrupt end, pretty much as quickly as it had begun. No more temperatures, no need to take the antibiotics and a smiley hungry cuddly boy asked if he could play Xbox. All is once again right with the world! But I feel for parents of children who are diagnosed with cruel, hideous illnesses. I’m thankful he is once again healthy and we’re all looking forward to a full night’s sleep! 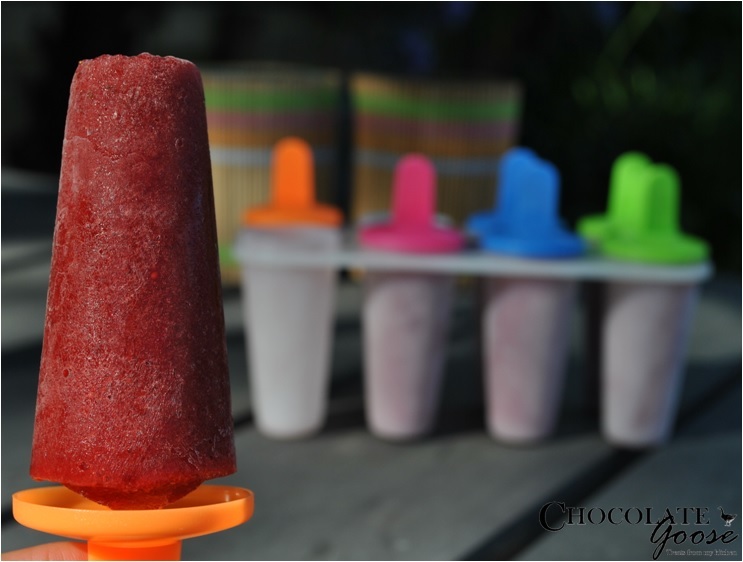 And I’m very glad I had a few of these tangy but sweet healthy strawberry ice lollies in the freezer. Not the post I had thought would accompany these delightfully bright tasty morsels, but when the weather is hot, you’re hot, the sun is shining and need a healthy snack treat to cool everyone down, try one of these. Made with some of the fresh strawberries from our strawberry picking trip and blitzed in the liquidiser with the tiniest amount of sugar. No need to add any liquid as ripe strawberries contain enough of their own gorgeous juices – it would be a sin to dilute it. If you don’t have ice lolly moulds, invest in some! I can honestly say that they are well used over the warmer months and you can experiment with anything from sorbets, frozen jellies or juice, or combinations with fresh fruit. Plus they aren’t very expensive at all. Rinse the strawberries and remove the stalks and leaves. If they’re very big, remove the white inner hull too as it can be hard and bitter. Chop the strawberries roughly and put them in a liquidiser. If you don’t have one of these, I’m sure a stick whizz mixer would also work – the kind to purée soups, baby food and smoothies. Add the sugar and blitz until relatively smooth and liquid. Pour into the moulds, insert the handles or sticks and place in the freezer. Make sure they can stand upright and don’t topple over.